A FLIGHT HAS made an emergency landing at Belfast City Airport this evening. All passengers on the BE996 flight from Southampton have now disembarked safely and are being looked after by airport staff. The emergency procedures were enacted as a ‘precautionary measure’ following the request of a Flybe pilot. 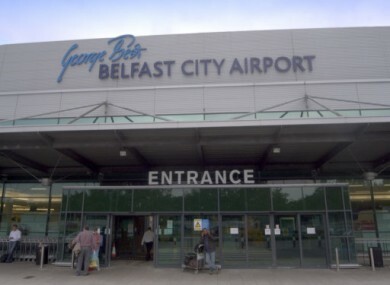 In a statement Flybe said, “The captain of the flight was alerted by a smoke indication from the rear baggage hold on its approach into George Best Belfast City Airport this afternoon. The crew took the necessary action and the aircraft landed safely…Flybe can confirm there was no sign of smoke when the aircraft had landed. The inbound flight from Southampton landed & all passengers disembarked safely. Passengers are now being looked after by airport staff. Flybe added that the incident will be fully investigated. Email “Flight makes emergency landing at Belfast City Airport ”. Feedback on “Flight makes emergency landing at Belfast City Airport ”.